Dimensions: 2 1/2" x 1 3/4" x 1/8"
This stunning bottle opener is made of cast metal and has a champagne gold-colored finish. It features a 3D rose design that is imprinted on both sides. 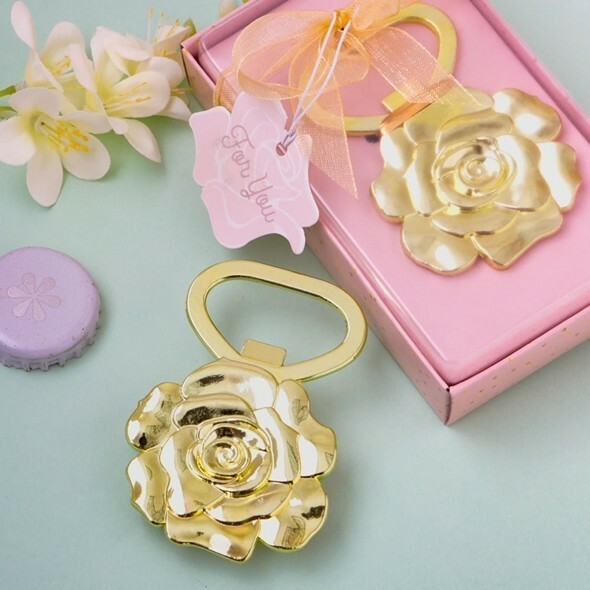 The rose is attached to a sturdy gold metal opener. The rose bottle opener comes packaged in a display-topped pink gift-box with a gold dots design. The box is finished with a gold organza ribbon and bow. Attached to the bow is a matching pink rose design 'For You' tag. Sold individually.